So, I've decided to give the sketchbook a rest for some time. I have nothing against the sketchbook or the whole idea of drawing in it everyday. It's just been a little repetitive and monotonous. I'm still gonna be drawing everyday, but just not in the sketchbook. I need a change in the format. 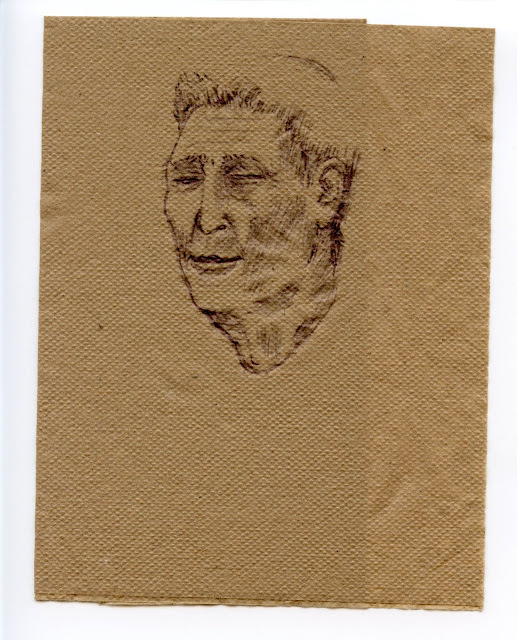 I draw to escape from the monotonous, so here I am, drawing on napkins that I found at 7/11. Feels good. I drew this face less than an hour ago while at work. I was on the phone with an elderly man and I think his voice goes well with this face here. Not sure why his eyes are closed, though.